Save the blobfish before they are wiped out! There are only about 420 blobfish left in this world, and the number is quickly decreasing! Use this website to find out how they are being wiped out, what you can do to prevent it, and to learn more about other endangered animals! What is a blobfish like? 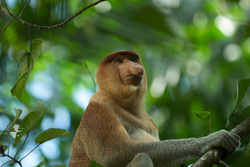 This is a proboscis monkey, another endangered species. There are less than 5,000 of them left in the world. Just like blobfish, they have huge noses. Save the proboscis monkeys too! !